It has been a quieter month for me competing; but at home I have been preparing for the National Championships with Bodyguard, getting Felix back up to full fitness and getting my homebred babies ready for their first outings next month. I have also been lucky enough to be offered the opportunity to compete three horses for Para-Dressage rider, Heather Bennett. The month started off with a couple of very rare days teaching at Oakridge Arena. If you have never been there I can highly recommend their facilities including a 5* restaurant. It really was the most fantastic food you could ever experience at an equestrian venue. As you know I work full-time so teaching isn’t something I am able to offer too frequently, so this two day stint was a lovely experience and the comments from all the riders were so good they have booked me in for next year! I then took two of Heather’s horses, Rara and Harry to Port Royal and then both of them and Gemini to Hill House Equestrian Centre where I am pleased to say we ended the weekend with plus 70% scores including a 78.96% and the infamous ‘10’ for our 10 metre loop. It’s fair to say it was an unforgettable weekend, made even better by the fact that Felix was feeling fantastic so we took him to Port Royal to do two Medium tests scoring 76% and 73% and then Hill House to do two Advanced Medium tests scoring 74% and 76%, both his highest scores yet at this level and he still isn’t up to 100% fitness. 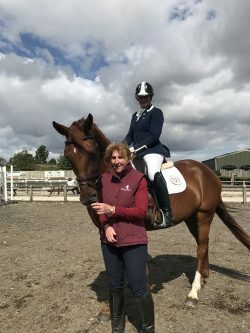 I am so looking forward to the future with all these horses and next year with them is going to be exceptionally exciting for both Heather in her Para-Dressage classes and for me at the Regionals and Felix stepping up to Small Tour level. My regular training sessions with Rhett Bird are helping me get a step closer to going out at Inter 2 and Grand Prix level. This is a huge milestone for me having only ever ridden up to the lower levels before. I have never even ridden a schoolmaster to get the feel of the piaffe, passage and one-time changes, so Bodyguard and I have had to learn together. At times I have wished it could have been easier, but it stands me in good stead for all my future projects to feel comfortable to train them up to Grand Prix level having done it with Bodyguard. This month I managed a very rare (in fact the first since Annabelle has been born,) night out with the girls and thoroughly enjoyed myself, although I will confess by 1am I was more than ready to take off my shoes, and return home to a comfy bed, maybe showing I am getting older! We also managed a long weekend to the Lake District with Gary’s family too which was well over due. This was my first experience of the area and I would certainly go back, it was lovely. Annabelle’s two new ponies arrived just as we returned from holiday. 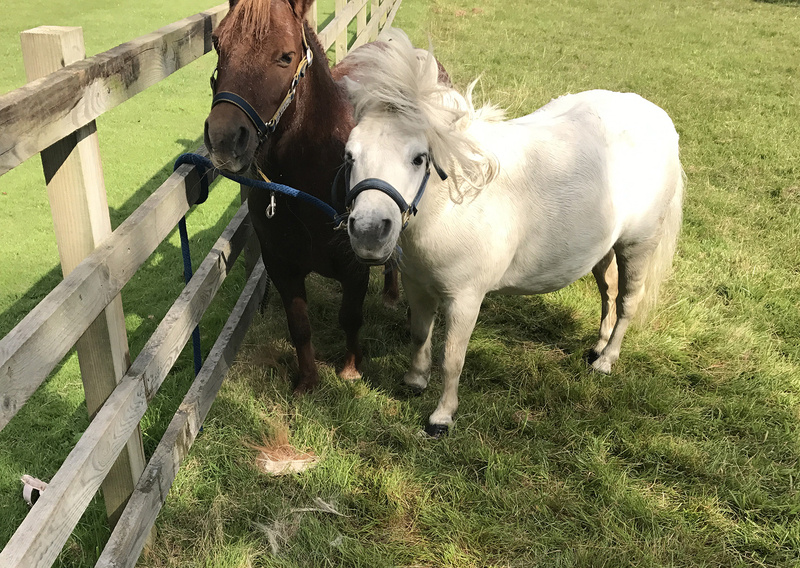 Rocket, a miniature grey pony approximately 9hh and Amber a gorgeous chestnut Shetland pony and it is fair to say she is more addicted than me! Within the first 12 hours of them being here she had been on and off them 16 times and brushed them to within an inch of their lives. This enthusiasm hasn’t slowed down after well over a month, even wearing her riding hat around the house till bedtime. As a yearly tradition the whole family headed to Burghley Horse Trials, I have been going here in the caravan for the week since I was five, and didn’t want this to stop when Annabelle came along. Luckily for us, my sister’s friend lives in Stamford and kindly offered us a double bed and a room for Annabelle which meant no camping. Annabelle was thoroughly spoilt including a rocking horse ordered for Christmas which we couldn’t get her off at the show. I think it is fair to say there is going to be one happy girl come Christmas morning.